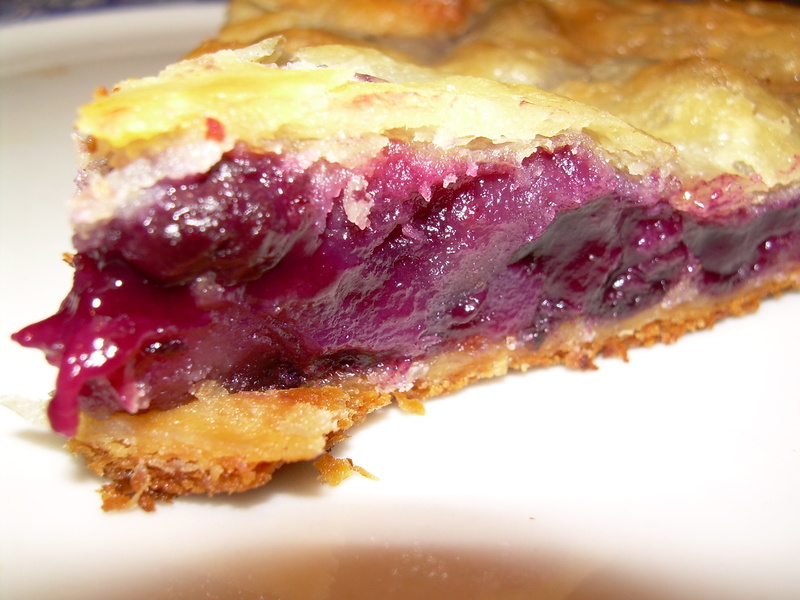 Pie is one of my favorite desserts, and blueberries are one of my favorite fruits. This pie was a winner – thank heavens I cut the recipe in half, or there’s no telling the caloric damage that would have been done! I did make a few changes, besides cutting the recipe in half: I used frozen blueberries, because the fresh ones around here are terrible, and cut back on the sugar a bit. I completely forgot to sprinkle the breadcrumbs on the crust bottom (my bad). I couldn’t find my shortening (which I use maybe once a year), so I substituted low fat cream cheese. Finally, I made a two crust crostata and baked the whole thing on a Silpat-lined baking sheet. The result? Pretty darn amazing. The pie actually tasted . . . fried. Oh, lordie, it was so good. I also liked that, after letting the pie rest for an hour before I cut into it, no runny filling! And for you pie bakers out there, Dorie’s crust recipe is quite generous – you will not find yourself with too little dough to fill the pie plate, as is often the case. Thanks to Amy of South in Your Mouth for this week’s selection. You can find the full recipe at her blog, or on pages 361-363 of Dorie Greenspan’s book, Baking: From My Home to Yours . And for the full Tuesdays with Dorie blogroll, see here. Your crostata looks fabulous! What a great idea! I, too, forgot to put in the breadcrumbs! Mighty tasty pie though! What a great looking crostata, wonderful idea! That’s beautiful! Cream cheese in the crust sounds amazing. Great job! Wow that really looks unbelievable. A crostata?! Brilliant. I wish I could be there to eat it! 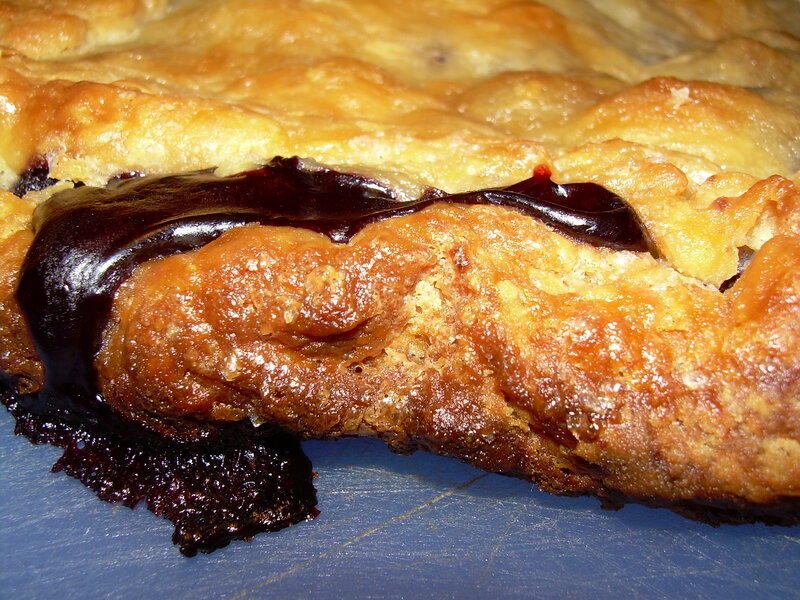 Love your golden brown pie crust and pretty purple filling. I used frozen too, but was not as successful than you. Great result! Wow, that looks amazing. I love that it’s a crostata. That is one delicious looking pie!! That is just about the most gorgeous looking blueberry pie I’ve ever seen. I am so making this recipe this summer and I’ve already flagged my book. Nice job on the crostata. I bet the cream cheese made the crust just divine! Okay so I admit I always look at the picture before reading the post. My first thought was oh, no, how sad what happened to her pie. It is so flat….well no wonder…duh! Looks great and what a great sub on the cream cheese. I’m going to try this dough with cream cheese next time… thanks for that inspiration. A crostata is a great idea, and so is the cream cheese. I love a cream cheese crust. It looks just beautiful! Great job! I love oozing filling. Your pictures look amazing! I agree about making half a pie.. with all that shortening and butter, it will probably take a while to burn it off! Cream cheese in the crust sounds great! These look delicious and perfect! Very generous pie crust amount. What a beautiful pie. Mmmmm. Cream cheese. everything you make is perfection. Ohhh, that first photo is edible!! It looks so yummy! It looks beautiful but you’r right…a definite diet buster! That crostata looks amazing! The filling looks wonderful too. You did an all-around fabulous job this week! 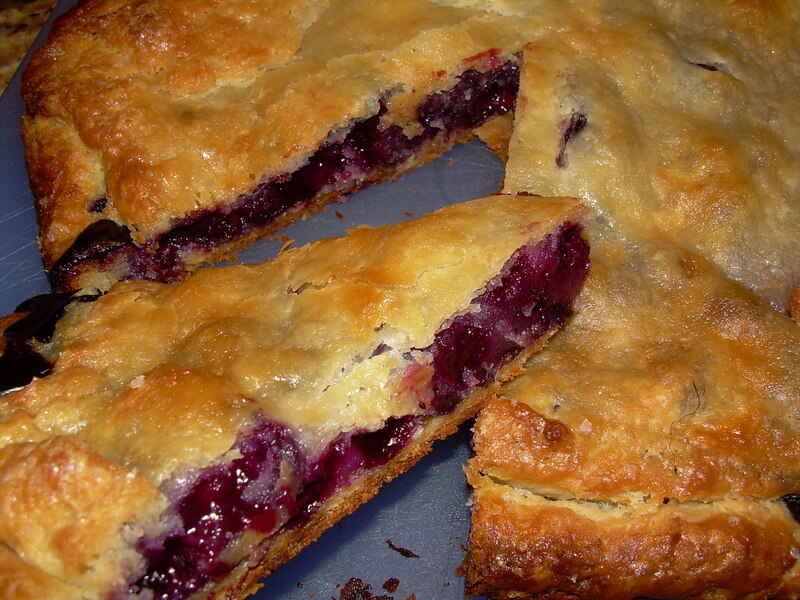 A Blueberry Crostada – how fantastic! It looks ready to eat straight from the computer screen. I also forgot the crumbs and my pie was a bit too liquid but it still tasted good. I’m glad to hear the filling wasn’t runny without the breadcrumbs. And your substitution of cream cheese instead of shortening is a great idea! Blueberry Crostata! It looks mouthwatering. I want a slice. Mmmmmm fried pie. That sounds tasty. I’ll have to keep cream cheese in mind as a go to substitute for crisco. Good Job! Fab job! I love your take on it! Mdm Chow, your bakes look so awesome, I likte the colour combination, the blueberry looks so intense! wow! I think that cream cheese was a brilliant substitution and my mouth is watering at the thought of how rich and yummy it must have tasted! Mmmmm, your filling came out such a pretty color. Great job and good thinking… cutting it in half. It was dangerous having a whole pie in the house! Your crostata turned out beautifully!! I love that first photo with the delicious filling coming out of the crust. Fantastic job! wow, i love how you modified the recipe – i love the idea of using cream cheese in place of the shortening – i hate using that stuff!